Days like today I’m grateful for my crock pot. My daughter wasn’t feeling well and just wanted to cuddle all day and my son had a late doctors appointment. I knew there was no way I was going to be able to cook dinner. Crock Pot dinners are great. Throw ingredients in early in the morning and sit down to a great dinner in the evening. I found this recipe for Santa Fe Chicken in the crock pot on Pinterest and it was terrible! The recipe called for too much liquid, way too long cooking time and it was bland. So I took the basic idea and made it something yummy that anyone would love to sit down to. I like to use crock pot liners- they are amazing. No clean up!! When you are done you throw it in the trash and your crock pot is clean. Now I have found that when you use a liner more liquid is retained in the crock pot. So if you use a liner you only want to add 1/2 cup of chicken broth. If you are not using a liner add 1 cup. Combine chicken broth, beans, corn, salsa, garlic powder, onion powder, cumin and cayenne pepper in the crock pot. Season chicken breast with salt and pepper and lay on top. About an hour before serving, remove chicken and shred if it hasn’t fallen apart already. Return chicken to the pot and stir in. Also add in the cilantro and scallions if you have them. Serve over rice or with tortillas and your favorite taco fixings. 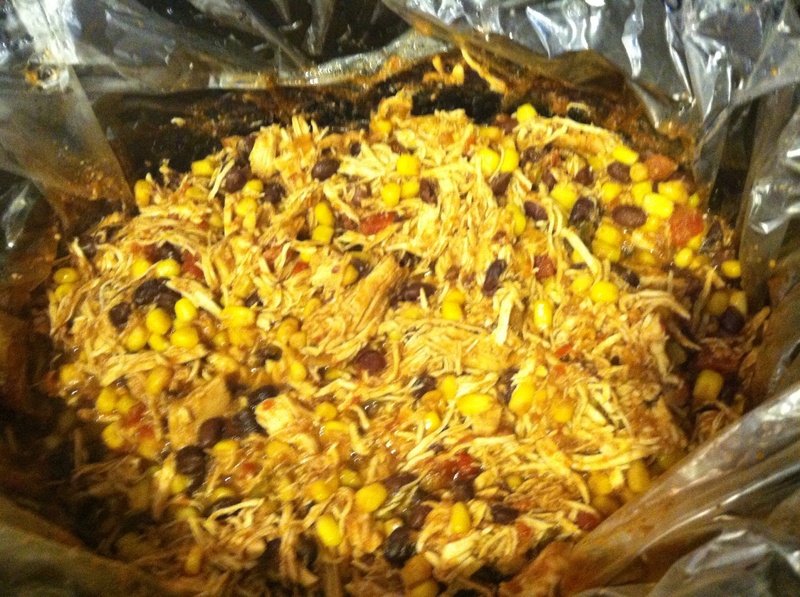 This entry was posted in Recipes and tagged Black Beans, CaseinFree, Chicken, Cooking, Corn, Crock Pot, Dinner, GFCFdiet, GFdiet, GlutenFree, Kid Friendly, Low Cal, Meal Time, Quick, Recipes, Salsa, Santa Fe Chicken, Tacos. Bookmark the permalink. Thank you Kristin, I now know what we are having for dinner tomorrow. Great! Let me know what you think!!! Kristin, we looooooved it! They asked me to put in the regular rotation. Your recipes are amazing! Thanks cuz! So glad everyone loved it!!! !